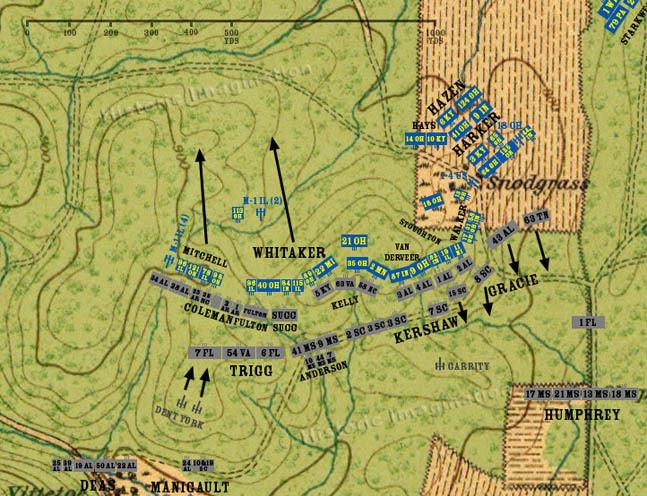 Either by design or by necessity, General Steedman orders the withdrawal of his division from Horseshoe Ridge. Below them, Trigg’s Brigade finishes deploying to the left of Anderson. The 43rd Alabama and 63rd Tennessee, having taken all the punishment they could from Walker, Harker and Hazen’s brigades, retreat from the Snodgrass cornfield.